Posted on July 30, 2018 July 30, 2018 by Margaret & filed under Food, Inspiration, Recipes, Slice of Life. I have often said, mostly to myself, that with just one onion I could make a feast with whatever else happened to be left in the cupboards. That is the perfection of an onion. Whether raw and finely grated, roasted in the oven, or sautéed and shiny from a bit of extra virgin olive oil, it always adds to a dish in a magical rather than definable way. This afternoon, as my husband and I were busy with our writing and designing, we took a quick break to ask, “What are we having for lunch? There’s no food in the house.” As soon as the words were spoken, they became a challenge. But first, I walked into the kitchen. Yes, I had one onion—a Vidalia. Even better. I come from a long line of people who can whip up a feast. No exaggeration, if a bus filled with senior citizens on their way to Atlantic City broke down in front of my mother’s house, she’d be able to feed all 55 of them in style. She grew up in a house with her Sicilian grandparents, both of whom were alchemists in the kitchen. Even when money was tight, platters of review-worthy meals would appear on the table every night. They knew how to make the most of what they had. With fresh herbs and spices, they coaxed you to savor each mouthful—to deconstruct and discuss and recall a memory that resulted in laughter. Of course, they didn’t knowingly do this. It’s how I see it in hindsight. And so, with those fond thoughts in mind, I started banging around my kitchen. Half an onion, finely sliced, some crushed red pepper flakes, chopped garlic, extra virgin olive oil. There were some cherry tomatoes, halved. A jar of grilled artichokes rescued from the back of a pantry shelf. Frozen peas. A bit of chicken bouillon. A handful of basil leaves from a flower pot on my window sill. A sprinkle of dried oregano. 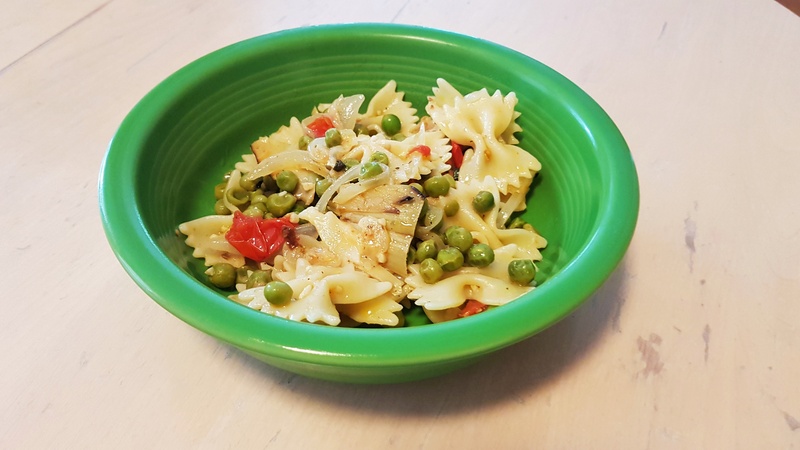 Tossed with al dente, bowtie pasta until the flavors blended. Then, a generous dusting of Pecorino Romano cheese, some cubed mozzarella, and fresh black pepper, coarsely ground. Food photography as an afterthought: This was what was left after I decided to write a blog post. One of these days, I’ll remember to get the shot before eating. 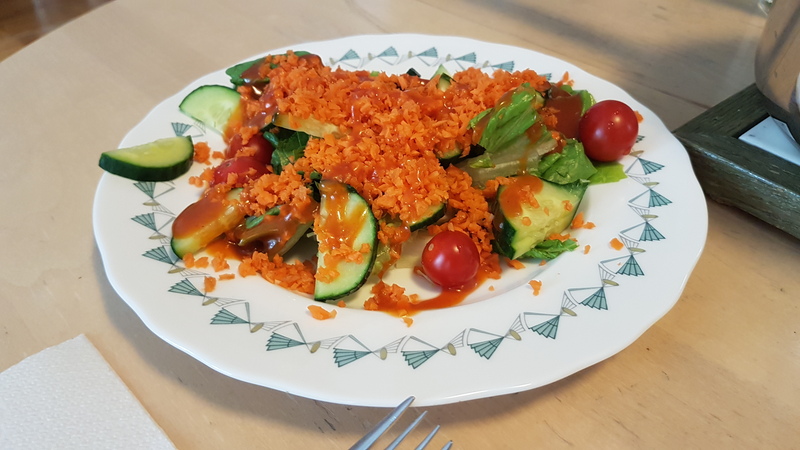 On the side, romaine lettuce leaves, cucumber, tomato, and a small mountain of finely chopped carrot with a drizzle of country French dressing. The hills are alive with the crunch of carrots. Hubby loves them grated in his salad. Nothing gourmet there. And yet, it was so satisfying. Over my husband’s shoulder, my great-grandfather was drinking red wine and singing love songs to my great-grandmother. She was slapping away his attempt at a pinch with mock annoyance. My grandmother passed fragrant platters of food around the cramped table that no one minded. My uncle erupted in his trademark silly grin at his first bite of perfection. Ah, the memories! Such a great tribute to my grandparents and uncle. I really miss having them around.